I wondered how, as a blind man, he managed to cross the street without an instant of hesitation until he showed me how he listened to traffic lights; I had never heard them before in this way. --Philip Glass, on fellow composer Moondog; from his introduction to Robert Scotto, Moondog: The Viking of Sixth Avenue (Process 2007). Born on this date in 1916, street poet and composer Moondog, aka Louis Thomas Hardin. He knew he was a drummer from an early age, starting with cardboard boxes as a little boy, and drumming in the high school band. Young Louis became blind after a farm explosion at age 16; he left his local high school and studied music and composition at the Iowa School for the Blind. He learned to read braille, and devoured books on music theory; he moved to New York City in 1943. 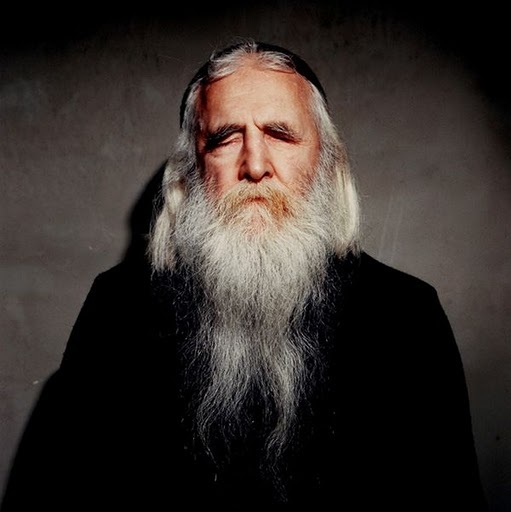 Within a few years of his arrival in New York City, he took the name "Moondog," and was performing his own compositions on the street, often in a Viking costume of his own devising. He was influenced by the jazz scene, and by city sounds. Moondog created his own instruments to make the sounds he wanted to hear: an Oo and a Trimba, among the most notable inventions. ""Performing in doorways was the only way to present my music to the public, but for playing on the streets I needed drums down close to the ground, so I used to design my own instruments and had a cabinet- maker put them together," he explained. Much of his music was recorded, including a 1957 children's album featuring vocals by Julie Andrews. The name of the hospital stands out, for its length and specificity: "The Asylum for the Relief of Persons Deprived of the Use of their Reason." The hospital offers relief, in the original sense of "asylum"--a refuge. The "person-first" language would satisfy the most ardent advocate of polite bureaucratese. Plain language wins too; no psychological jargon in this institution's name, because psychological jargon as we know it didn't much exist in 1817. What else stands out: the hospital still exists. It's had various names over the years, of course, reflecting shifting treatments and labels and goals. Its 1813 mission statement says the asylum's Quaker founders "intended to furnish, besides requisite medical aid, such tender, sympathetic attention as may soothe their agitated minds, and under the Divine Blessing, facilitate their recovery"--intentions that reflected the most progressive ideas about mental illness and care in their time. The site and the building were modeled on York Retreat in England, "but with better ventilation and light." As the first of its kind, it set a standard that shaped similar institutions for generations; in 1999 it was named to the list of National Historic Landmarks. Of course, hospitals seldom live up to their lofty mission statements, especially after almost 200 years. As with most institutions, it's not hard to find stories of abuse. PhillyGrrl had a three-part series about one man's protest at Friends Hospital. But it's maybe a little more ironic in this case: Quakers originally got into the asylum business after investigating the death of a Quaker widow, Hannah Mills, at the York Asylum in 1790. They condemned the abusive conditions they saw, and sought to do better. It's hard to imagine more formidable parents than Catherine and William Booth, the founders of the Salvation Army. Intensely religious and endlessly energetic in the pursuit of their causes, they had eight children, two of whom became "generals" in the Salvation Army. In fact, daughter Marie was the only one of the Booth children who didn't work for the Salvation Army. My mother often said that our sister Marie, two years older than I, was her most beautiful baby. But at a very early age smallpox weakened her health and she could not profit by study as did the rest of us, nor in later years take part in public life. Being nearest to her in age, my mother asked me to make it my duty to help her with her lessons and see that she had a place in the games. For two days I refused to say I was sorry for the reason I could not say so truthfully, after which my mother returned.... It might have been right to defend Marie but she was sure I was sorry for the way I had done it. I still wanted to say "No," but I caught the dimness in my mother's eyes and I replied, "Nearly." I was nearly sorry. Marie attended public family events and held the rank of "staff captain" in the organization. She died in 1937, age 72, and was buried with her parents. This could be health or social care, but also the care family members provide each other or self-care, of course. Please submit your posts in a comment here or E-mail me by May 25. I will post the carnival on May 29. Astrid also mentions that the Blog Carnival of Mental Health's May edition will be hosted at the Madosphere, with the theme "patients and professionals." Disability history is too important to hide away in journals, it's too important to bury in jargon, it's too important to present to empty conference rooms. Disability history is more than a line on your CV, academics. I'm frustrated whenever I find some really amazing disability history in a scholarly journal. Why? Because it's in such an inaccessible place, and often presented with such inaccessible language that it will never reach the majority of the audience who wants, needs, and will use that history in their work. Of course I know that journal articles and conference presentations are part of the game of academic careers. But if your work is valuable and relevant beyond the department hallway, don't you have a further obligation to find that audience and present that work in accessible formats? Blog about disability history. 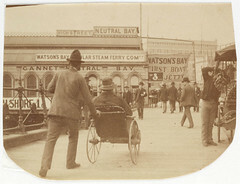 Post disability history images on Flickr. Curate a disability history exhibit off-campus. Make a zine. Start a Wikipedia entry, or improve one that exists. Speak to non-academic audiences about your work. Speak to children about it (there's a real challenge). Write for non-academic audiences, on op-ed pages, in local publications, in national magazines. Make a podcast. Make a video and post it online. Donate a copy of your book to a public library. Don't wait for someone else to do it. Don't assume your work is too esoteric. Don't dumb it down, but use plain language and express yourself clearly. Take a class if you need new skills. Enormous potential is wasted when you don't take responsibility for putting it where it can be read and seen and discussed, by teachers and retirees, by activists and local government officials, and other folks who can't take books out of university libraries or attend scholarly conferences. It's not just giving, either; taking your work off-campus is also an opportunity to see its practical dimensions, and to learn about resources for further study that aren't in the usual places. What can disability history do if you take it off-campus? It can ignite, it can comfort, it can inform, it can connect, it can solve mysteries and correct misunderstandings. Tracking down a history of families like mine was a priority when my son was first born--if I don't know those stories, how do I know where we fit in? Whose pasts can we learn from? There was a hunger to know that went far beyond thinking about a postdoctoral project or an interesting reading to assign to a class. The conventional wisdom is full of nonsense about disability history; solid scholarship that reaches into the community can engage that nonsense and replace it with something far more powerful. If you're doing disability history, it should matter.